Stone Mountain GA – (17 July 2014) – Friends of Disabled Adults and Children (FODAC), a non-profit organization providing over $10 million annually in durable medical equipment (DME) and supplies to the disabled community, honored its founder Ed Butchart on Friday, July 11th with a private celebration held at FODAC’s Stone Mountain offices. Stone Mountain mayor Pat Wheeler attended the reception for Butchart’s 79th birthday along with about 50 family members, friends, colleagues and associates. 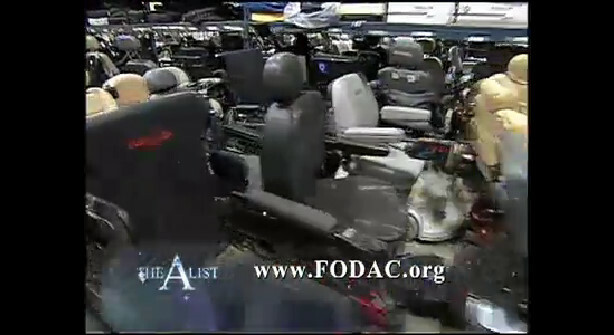 Chris Brand, president and CEO of FODAC, opened the celebration by introducing a short film on FODAC’s history, tracing the journey of the organization from Butchart’s garage, where he collected and repaired donated wheelchairs for those who couldn’t afford them, to the current 65,000 square foot facility providing annually over $10 million in equipment and services to the mobility impaired in 46 states and 65 countries. Cliff Snider (pictured, right, with the Ed Butchart), a representative from the International Santa Claus Hall of Fame, announced Butchart’s induction into the 2013 class. A professional Santa for over 20 years, Butchart published “The Red Suit Diaries” in 2009 and its sequel, “More Pages from the Red Suit Diaries” in 2011. During his career, he served as FODAC’s Santa for its annual “Breakfast with Santa” fundraiser. Butchart then spoke briefly to the crowd, thanking everyone for the honors and recognizing those who had helped him during his life. Several attendees then took the mic and shared favorite memories of Butchart, thanking him for his contributions to themselves and the community.